I am so craving fall foods. And, pumpkin is an absolute favorite of mine. I'll pin this, and tuck it away for a special fall bible study treat :) Thanks!! I love pumpkin foods, even though it's a sign summer is coming to an end. These looks great! How unique. Never thought of adding pumpkin into brownies! So perfect for fall or any day. Oh my...this is dangerous! 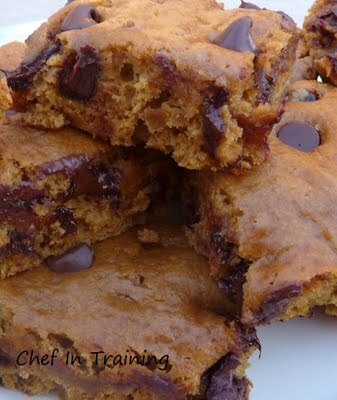 Pumpkin, chocolate chip and brownies...one pan for me and then one pan for everyone else to share.